On 18 April 1910, Janet Spens was the first woman to be awarded a DLitt by the University of Glasgow, having published her first work, Two Periods of Disillusion the previous year. "to her, the quintessence of things was revealed only in art, especially literature, and above all in poetry." In 1903, Spens and Margaret Watson had founded Laurel Bank School for Girls in Glasgow, the first school to be founded by Scottish women graduates. Three years later Spens had been appointed assistant lecturer in the English department at Glasgow University and in 1909 she was appointed tutor to the women students in arts. In 1911, she was appointed a tutor in English Literature at Lady Margaret Hall, Oxford, where she remained for twenty-five years, latterly as an emeritus Fellow. Her later publications include An Essay on Shakespeare's Relation to Tradition (1916), Elizabethan Drama (1922) and Spenser's Faerie Queene: an Interpretation (1934). Born 23 January 1876, Hamilton, Scotland. 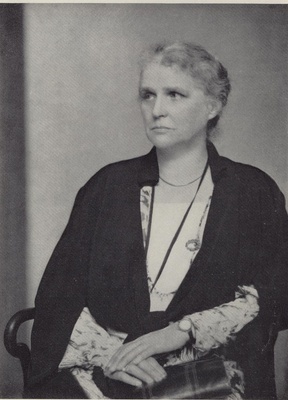 Janet Spens (1876-1963) was the first woman to be awarded a DLitt by the University, on 18 April 1910. She was a founder of Laurel Bank, the first school to be founded by Scottish women graduates. Spens was born in Hamilton the daughter of Walter Cook Spens, a Glasgow advocate and Sheriff-Substitute of Lanarkshire. She and a sister were sent to live with an aunt in Edinburgh where she was educated by governesses until she was fourteen, and then at private classes in the city. She returned to Glasgow and attended classes for two years before matriculating. She graduated MA in 1899. In 1903 Spens and Margaret Hannan Watson founded Laurel Bank School for Girls in Glasgow. Spens preferred teaching adults and, during her five years at Laurel Bank, she also taught adult literature classes. In 1908 she was appointed Assistant to Professor Macneile Dixon in the Department of English Language and Literature at the University and in 1909 she became Tutor to the women students in Arts. She published her first work, Two Periods of Disillusion in 1909 and was awarded her DLitt the following year. Her later publications include An Essay on Shakespeare's Relation to Tradition (1916), Elizabethan Drama (1922) and Spenser's Faerie Queene: an Interpretation (1934). In 1911 Spens was appointed a tutor in English Literature at Lady Margaret Hall, Oxford. She remained for twenty-five years, latterly as a Fellow. With Eleanor Lodge, the History tutor at Lady Margaret Hall, she started the Oxford National Education Association to provide contacts between teachers in elementary and secondary schools and university academics. Spens retired as a tutor at Lady Margaret Hall in 1936, but she continued teaching part-time into her seventies. She was created an Oxford MA by decree when women were admitted to full membership of the university and in 1954 she was elected an emeritus fellow of Lady Margaret Hall. 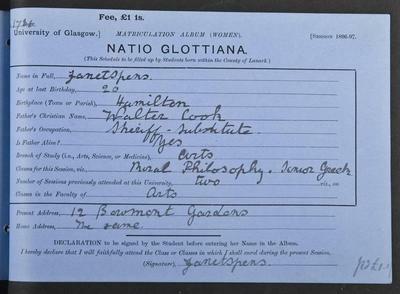 In 1944 the University of Glasgow awarded her an honorary doctorate of laws, an honour her father had received in 1889. In 1910 Janet Spens was the first woman to be awarded a DLitt by the University of Glasgow. World Changing Project, "Leading literary criticism," in University of Glasgow World Changing (University of Glasgow, 2010); http://www.worldchanging.glasgow.ac.uk/article/?id=112 (accessed April 23, 2019). World Changing Project. "Leading literary criticism." In University of Glasgow World Changing. University of Glasgow, 2010. http://www.worldchanging.glasgow.ac.uk/article/?id=112 (accessed April 23, 2019). World Changing Project. "Leading literary criticism." University of Glasgow World Changing. University of Glasgow, 2010. 23 April 2019 <http://www.worldchanging.glasgow.ac.uk/article/?id=112>.